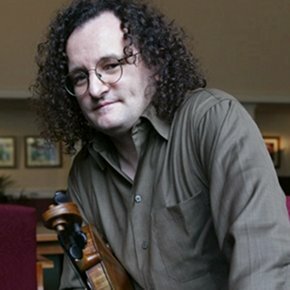 Martin Hayes is regarded as one of the most extraordinary talents to emerge in the world of Irish traditional music. His unique sound, his mastery of his chosen instrument – the violin – his acknowledgement of the past and his shaping of the future of the music, combine to create an astonishing and formidable artistic intelligence. He is the recipient of major national and international awards: most recently the prestigious Gradam Ceoil, Musician of the Year 2008 from the Irish language television station TG 4; previously Man of the Year from the American Irish Historical Society; Folk Instrumentalist of the Year from BBC Radio; a National Entertainment Award (the Irish ‘Grammy’); six All-Ireland fiddle championships – before the age of nineteen – and cited by the Irish Sunday Tribune as one of the hundred most influential Irish men and women in the fields of entertainment, politics and sports in the year 2000, as well as one of the most important musicians to come out of Ireland in the last fifty years. He has recorded two acclaimed solo albums, “Martin Hayes” (1993) and “Under the Moon” (1995) on the Green Linnet label. Martin Hayes is the Artistic Director of the Masters of Tradition Festival held in August each year at Bantry House in Bantry, West Cork, where Ireland’s most distinguished traditional musicians are invited to play in an exquisite chamber music setting. In January 2009, Martin Hayes will lead a group of Masters of Tradition musicians to the Sydney International Festival where they will perform at the Sydney Opera House for two nights. A native of County Clare, to which he returns for extended periods several times a year, Martin Hayes has been based in the United States, now living in Connecticut, for the past twenty-three years. He has drawn musical inspiration from sources as diverse as the Estonian composer Arvo Pärt, the Spanish viola da gamba master, Jordi Savall, and the jazz genius, John Coltrane, but remains grounded in the music he grew up with in his own locality, Maghera, Feakle, East County Clare where the music which he learned from his late father, P. Joe Hayes, the legendary leader of the long-lived Tulla Ceili Band, profoundly influenced his musical accent and ideas forever after. In his younger days he played in an experimental electric band in Chicago; recently he has composed scores for film, theatre, and modern dance, and has collaborated with like-minded musicians from other genres, such as jazz guitarist, Bill Frisell and eclectic violinist Darol Anger. He views these explorations as a means of shedding light on his ongoing artistic journey, as well as a challenge to any rigidity of thought. The fundamental artistic quest is to go deeper and deeper within traditional Irish music and himself.